Optimizing manufacturing processes ultimately revolves around increasing output at reduced cost and improved quality. Manufacturers try to minimize inventory levels by scheduling just-in-time delivery of raw materials, but even the smallest miscalculation can cause stock-outs that lead to production delays. Sensors andRFID tags can capture supply chain data, but this creates a large, ongoing flow data. Hadoop can cost-effectively store this unstructured data, providing manufacturers with greater visibility into their supply chain history, and greater insight into longer term supply chain patterns. This gives manufacturers more lead time to adjust to supply chain disruptions, as well as helps reduce costs and improve margins on finished products. Hewlett Packard Enterprise and Hortonworks have a strategic partnership to help manufacturers realize their modern data architecture. 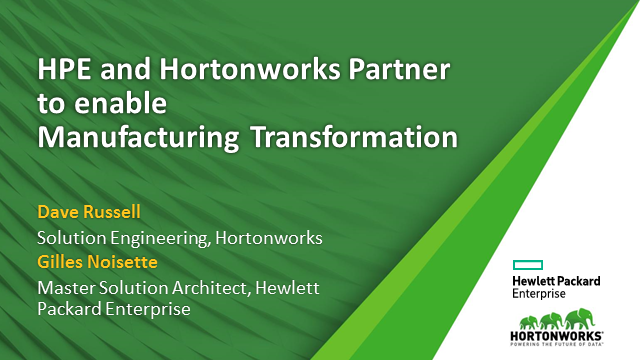 Join us for this webinar on Thursday,October 13 at 10:00 AM BST and learn how Hortonworks leading enterprise-ready open data platform in combination with HPE’s leadership position in the worldwide x86 server market provides manufacturing organizations with proven solutions to help transform manufacturing processes.